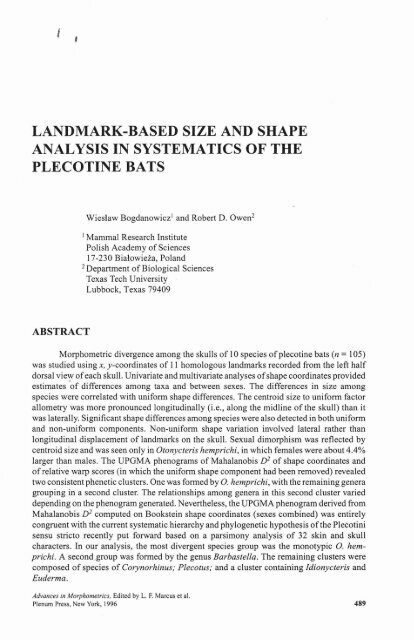 Landmark-Based Size and Shape Analysis in Systematics of the Plecotine Bats 495 Figure 3. (a) Distribution of canonical-variate centroids of 10 species of plecotine bats in three-dimensional space. The first three canonical-variate axes account for 35.3, 32.0 and 12.8% of the total sample variation, respectively. (b) Relative warp analysis (uniform factor removed) of 11 pairs ofx, y-coordinates from the dorsal view of the skull showing projections of 10 species of Plecotini onto the first three relative warps.  The first, second, and third axes account for 42.5, 25.7 and 14.1% of the total variance. Both plots are shown with minimum spanning trees superimposed. Species abbreviations as in Fig. 2. A canonical variate analysis based on the Bookstein shape coordinates reveals five possible groupings that consist of: (1) Otonycteris, (2) Euderma, Idionycteris, (3) Plecotus, (4) Corynorhinus, and (5) Barbastella (Fig. 3a). Similar patterns are seen both when a minimum spanning tree is superimposed onto the plot for the first three canonical variates and when a UPGMA phenogram is computed from canonical variate scores (Fig. 4a). Otonycteris hemprichi is the most distant from all other taxa. Euderma maculatum has as its nearest neighbor I. phyllotis, and they are connected to the group I? austriacus and R auritus. Corynorhinus townsendii, C. rafinesquii and C. mexicanus are intermediate between the genera Plecotus and Barbastella.